Hibiscus Rosa Sinensis helps in inducing abortion, provide treatment for headache . Its also good for hair treatment, swellings and mumps. The leaves are anodyne, aperient, emollient and laxative. A decoction is used as a lotion in the treatment of fevers. Amaryllis are bulbs of the genus Hippeastrum that are native to tropical and subtropical areas of the Americas. Some species grow in rock crevices in savannas that have distinct dry and wet seasons; others grow in high plateau regions that have cool weather for most of the year. Fresh cut flowers-roses, gerbera, anthurium, lilium, carnation, bop, orchids-sonia and dendrobium-lays and garlands, jasmine string & marigold. fresh organic fruits. Alphonso mangoes and pulp. fresh organic vegetables. 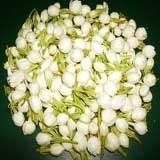 We are leading supplier of jasmine flowers.